Colour: Straw. The nose is initially very tight and closed up, sweet, dark, woody, “moody”. It gets sweeter over time with very interesting notes coming through. Blueberry muffins (yeah, I know…), very ripe dark gooseberries, dark cherries, marzipan, cracked peach stones, toffee, demerara sugar. Very well integrated alcohol even undiluted at 53.3% – most standard 40% drams are sharper on the nose, this one is very mellow. With water I actually get more of the alcohol and the aroma fades more into the background. It takes some time in the glass after adding water to regain its nose, but it doesn’t really change. Fizzy sensation on the tongue on the first sip. The palate offers a mixture of sweetness and oak spices coming in from the background. Very oily, resiny, yet with a pleasant slight bitter- and dryness. Quite chewy, reminding me once again of the blueberry (and toffee) muffins. This is not to be mistaken for a sherry-fruity dram, though, it’s more along the lines of a demerara sugar and malt extract sweetness. The alcohol is more noticeable than on the nose, but well-integrated. Very hard to make out individual notes, it’s a very dense, thick sensation. Adding water actually kills the thick, dense, oily texture contributing nothing to the flavour – it confirms what I wrote about the nose: Leave it at bottling strength. The finish opens on the dry side, the oak influence really comes through but then recedes to reveal more sweet toffee notes about half a minute in. More malt and pleasant oak notes further down the road, lingering for a long time. This 20 year old “Glenlossie-Glenlivet”, as Cadenhead’s preferres to title the distillery, represents a very thick, oily, sirupy-sweet, juicy, complex dram. Bottled at just the right time – great wood influence but not yet overpowering. Definitely not a summer whisky but not a wintery sweet sherry-type dram either. Perfect for autumn, I think. Very approachable at bottling strength, too, I don’t recommend adding water, it takes away some of the texture yet doesn’t really open it up. 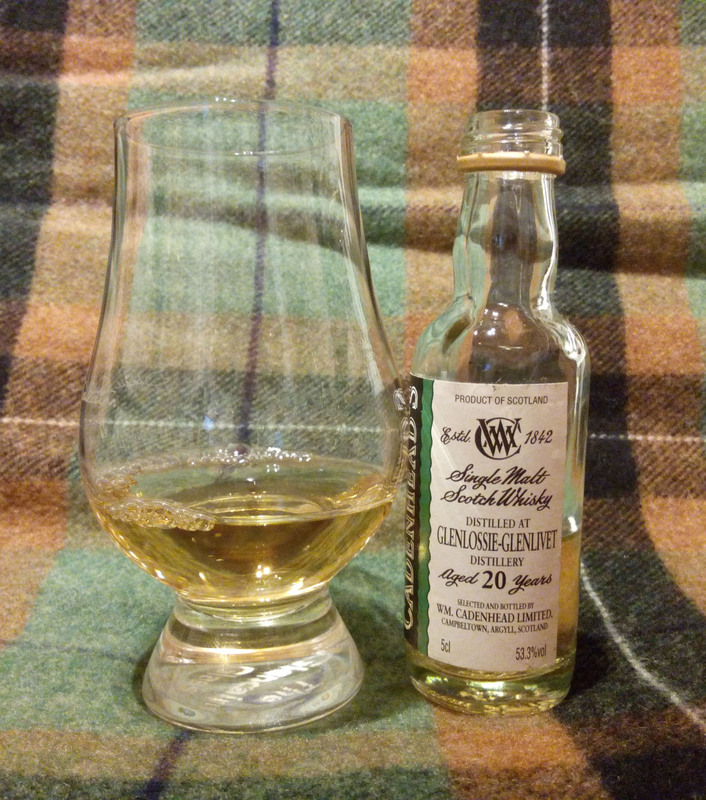 The sample for tasting was kindly provided by Cadenhead’s Whisky Market Austria. Cheers!